I'm trying something different. Short story, I've been a member of SCCA for 40 plus years and with all of the SCCA Production cars available I'm thinking of trying to expand on them (thanks JD for all of these cars). 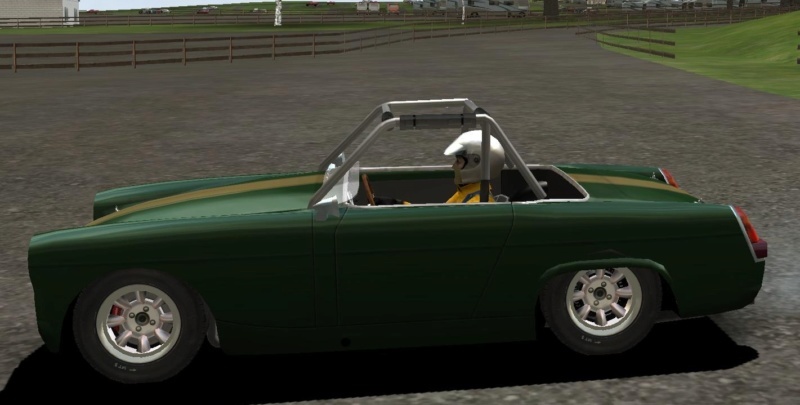 I've successfully pulled the cage style rollcage from the 914 mod and resized it to work in the Midget. However, as you can see by the picture, it shows up in 3DSimEd as pink, which I beleive indicates that there is no texture associated with it to read. I did copy and paste the OBJ.GTR and TEX.GTR files from the 914 and into the Midget folder as well as add them to the CAS file, but it doesn't appear to be pulling from them. Any thoughts from you guys? I made a little recherche and i think you used the rollbar style1 from jds PORSCHE_914-4_ EP Mod. they are two materials in use. The first on called "rollbar_pads" seems to work fine. the second one (wc_cpit_03a) causes the issue. Definitly you need the Texture "PORSCHE_914_CPIT03.DDS". Another reason for the issue is, that the car already use a Meterial with this name, but then there has to be texture on the pipes. 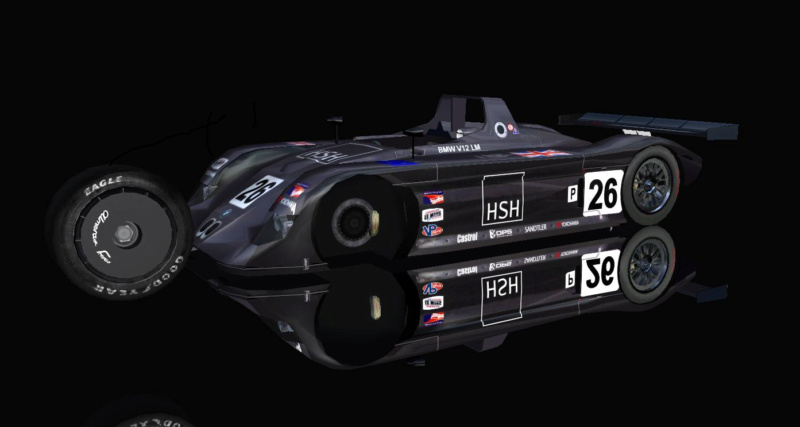 "wc_cpit_03a" is one of the textures that skinners can use for individual painting..
You need only the Materials "FI_INTERIOR.DDS" and "PORSCHE_914_CPIT03.DDS"
BTW, what i would do. 1. Cut the Rollbar and copy to a new file. 2. Go in the File with the Car to /Display/Material Filter, klick on "wc_cpit_03a" in the material list and klick OK. If you see something, good, If you see nothing, better. In the second case there must be the texture i talked about missing. Better because you can Paint the Pipes for every Car individually. But be careful, "wc_cpit_03a" can be in use in a Cockpit.gmt-File. Im not sure if 3dSimed load the Cockpit Files when you open a .car-File in it. A link to the Midget Mod would be helpful, if you cant solve the Problem now. So I figured out the texture issue. I went and reasigned the texture in 3DSimEd to one that already existed in the file as a test to see if it worked. Just so happened to be the helmet.DDS file already in the car and the experiment worked fine. I know now I can rename the file, customize the color and save it in the car file and it will work. Next issue is, I was able to re-scale the cage to fit into the Midget and it appears correctly in 3DSimEd. It's also properly re-scaled in game. I've also had to re-position the cage in 3DSim Ed (move it backwards in the Y-plane, and it shows correctly in 3DSimEd (in my original picture above). But in game, it's not moving it in the Y-plane. Re-scaling shows properly in game, re-positioning does not. Thoughts? So, I thought I had the texture of the cage sorted. 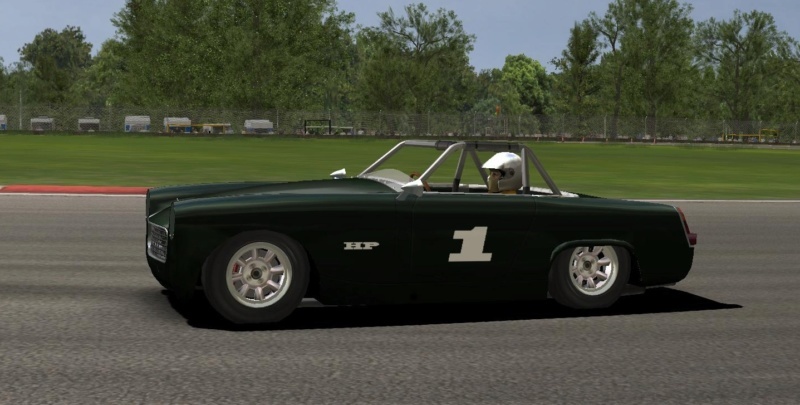 I created a DDS file specifically for it color (named it MG_Midget_Rollbar_Cage_HP.DDS (basically a single color white box) and then assigned that file as the texture file to the cage in 3DSimEd. When I assign it in 3DSimEd, it graphically turns white in the editor. However, when in game it still shows as silver. 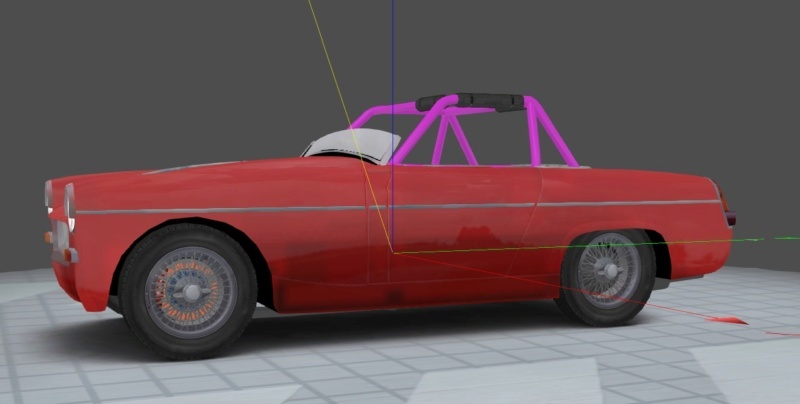 With the following Materials you can paint the Rollbar individually. Theres more to say, thats the short version. Still having troubles figuring out the positioning issue using 3dsimed3. I can import a new object just fine, and position it correctly in 3dsimed. I even save it, and it reloads just fine in the editor. 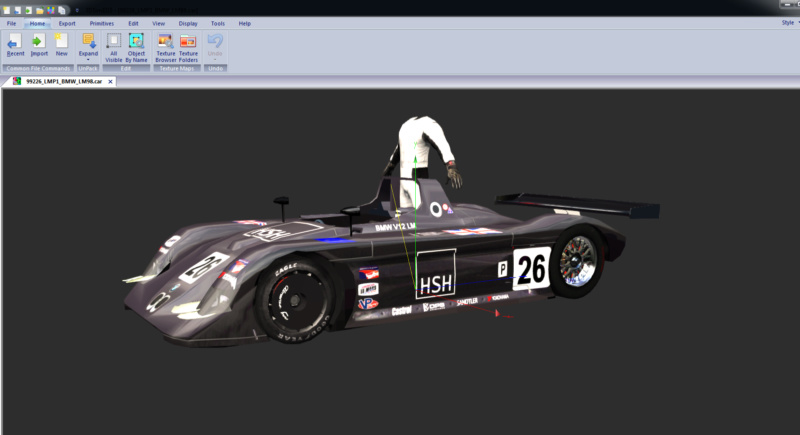 But in GTR2, it still will not show correctly, like the cage position above or the little experiment I have going on below. Sorry, trying to learn all this by fire. Just a thought.... Is the chassis you're using in 3dSimed when positioning things the same as the CHASSIS_A that displays in game? If it's an EXPO specific chassis for example it could be in a slightly different position so the cage might not display correctly when you run the game. As for the issue with the wheels moving out of position have you checked the HDC file to see if there's values entered for the track and wheelbase? Maybe it is an issue at 3dsimed exporting. If i exporting, the Pivot Point Values in the Popup window are always Zero/Zero/Zero. I think i remember, they were other values one time and the Mesh was out of position after export. You can change the values to Zero. Maybe this can help you. Otherwise it helps, when you open a File with correct Position. You delete the whole Mesh. Then you copy all from the problem-file in this file and save (obviously with the name of your problem-file). I believe it's the same as referenced in the CAS. Not 100% sure, so I'll check this. As for the wheel position, I know for sure the track and the wheelbase is set at all zero's (this has bit me before when re-scaling so it's one of the first places I looked to see if it was causing my issue. I'm angling this way myself since I'm having the same issue of positioning in different mods with different parts. I tried re-importing the object and setting the pivot point values to zero and re-saving but it didn't work. I'll try again from scratch because maybe my order of operations is wrong? I'll see what I can find. Very Dummy-Style but if it works, it works! If the Mesh is on right Position in ZModeler. Then Export as.obj-File import again and export back to .gmt-File. Be careful dont overwrite your original File. Export as obj-File is only Possible in ZModeler 2.2.6 and higher as far as i know.